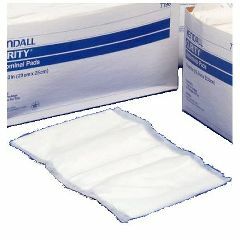 Curity Abdominal Pad - Sterile - 5" x 9"
Kendall Curity Abdominal Pads 5 x 9"
Kendall Curity Abdominal Pads are designed for maximum absorbency and comfort. All four edges are sealed to prevent lint residue and leaking. Why do your CURITY Abdominal Pads look different? There is no change to the product itself. We simply changed the way we fold and package the product. Although case counts increase, the per unit price remains the same. Promotes Healing. Easy To Use. Effective. Safe. comfortable. Long Term Use. help with wound weepage. help with wound weeping. I became bed-bound 4 years ago. My skin is what I call supremely stupidly sensitive skin and during my time in bed it's gotten paper-thin rips and bruises easily. We've been using ABD pads to provide extra cushioning. My husband has an abdominal wound area since 2003 that will probably never heal according to his doctors. I use one of these every night, along with several other items, to help keep the wound area clean and protected. It works beautifully!! Outdoor Activities. Emergency Preparedness. Keep In The Trunk. Keep In The Medicine Cabinet. Quick Fix. Long Term Use. Parent. Novice First Aid Skills. Long time wound. I use it to cover a long time wound. It works great, it is absorbent and keeps the wound clean as can be. I would recommend this bandage to anyone. great for heavy draining wounds. Effective. Easy To Use. Promotes Healing. Safe. GREAT FOR DRAINING WOUNDS. MY PATIENT HAS A NON HEALING WOUND TO HIS LEG AND THIS 5X9 HELPS ABSORB HIS DRAINAGE AT A GREAT PRICE.